Major Holley Jr., bass; Bill English, drums. "The blues," Duke Ellington wrote, "the blues ain't nothin' but a cold gray day, and all night long it stays that way . . . the blues is a one-way ticket from your love to nowhere; the blues ain't nothin' but a black crepe veil ready to wear." That's the way Kenny Burrell felt when he talked with Alfred Lion about the idea for the album. "I have always had a love for the blues," he said. "In my earliest days in Detroit I worked with groups that concentrated a great deal on the blues. And I wanted to get a group together for this session that can feel the blues just the way I do." Kenny decided that there would be no need for a piano on this occasion; not that he believes exclusively in pianoless rhythm sections as such, but the sound just wasn't required for his concept of the groove he wanted to establish. "Chitlins Con Carne," the first title on the record, gives you more than a hint of what is coming. Ray Barretto, a master of the conga drum techniques, sets a Latin mood; a touch of bossa nova, but basically it's strictly the blues. And Stanley Turrentine wails in a manner that makes you wonder how many times that verb has been thrown around loosely and superficially. This is definitive wailing. "Soul Lament" is Kenny's personal--very personal--solo message. The way this melody and its interpretation are constructed, it's almost as if Kenny were asking questions and answering them for himself. The tempo changes, but the mood keeps the same feeling, as Kenny introduces another minor-groove theme, the title number of the album. This time, though, he's joined by the rhythm section and there's a beat so firm that the tempo may seem faster than it actually is. This one, too, is Burrell all the way. "Wavy Gravy" could have been called "Building The Blues," for it has a pattern of mounting intensity. Both Stanley and Kenny offer in this jazz waltz some of their most inspired moments of the whole album; I found myself feflecting how sad it is that because of the prejudices of those days against anything but four-four time, men like Charlie Christian and Chu Berry never got to waltz the blues. "Gee Baby Ain't I Good To You," the only standard tune in this set, goes back to around 1930 and McKinney's Cotton Pickers, whose director, Don Redman, wrote the music. "It's a ballad," says Kenny, "but essentially it's still the blues." "Saturday Night Blues" brings the session to a solidly rocking conclusion; the blues with guts. 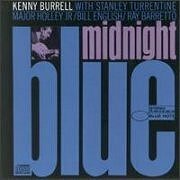 Stanley plays as if he never had it so blue, and Kenny offers convincing evidence that Saturday night is the bluest-tinged night of the week. Looking over the whole session, studying the seven perfomances and their relationship to the blues, you gain a valuable picture of the variety of moods, tempos, beats and feelings that the blues can involve. Each number is somehow different from the rest, yet all have that indefinable quality that can best be summed up in words as a down-home blues feeling. But wherever it is and no matter where you want to go in quest of the roots, these sides will take you down home in a swinging, gentle haze of midnight blue.